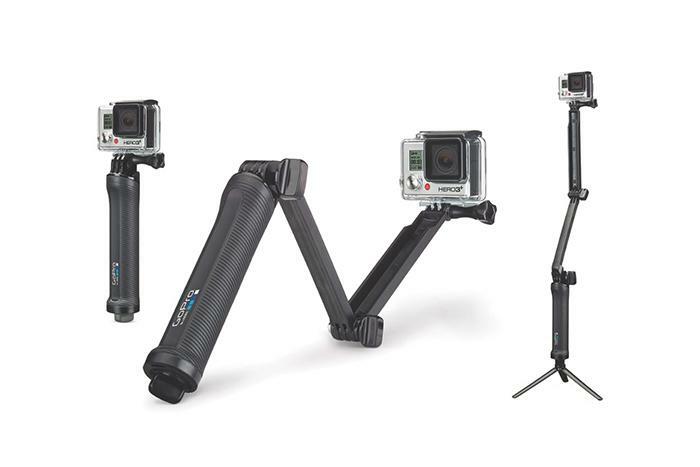 GoPro released two new camera mounts ideal for shooting a variety of action sports. With summer right around the corner, many of us are going to feel that pull toward the nearest pool, beach or ski slope. Wherever you decide to have some fun, make sure to bring your GoPro along—and with the release of two new, versatile GoPro camera mounts, you’ll be able to capture action footage in new ways. The 3-Way mount can be used as a camera grip, extension arm or tripod. The flexible arm of the 3-Way is works well when shooting point-of-view or follow-cam footage, or even when you take that inevitable selfie; the mount itself won’t make an appearance in any of your shots. You’ll be able to detach the mount’s handle and use it as a camera grip. The handle conceals a lightweight, mini tripod that is removable; the tripod can be used on its own if you’re looking to capture some static shots or with the handle, the choice is yours. The 3-Way is waterproof and is able to be fully submerged in water. The mount expands to 20 inches (50.8 cm) and collapses to 7.5 inches (19 cm), giving you a lot of room to work with. 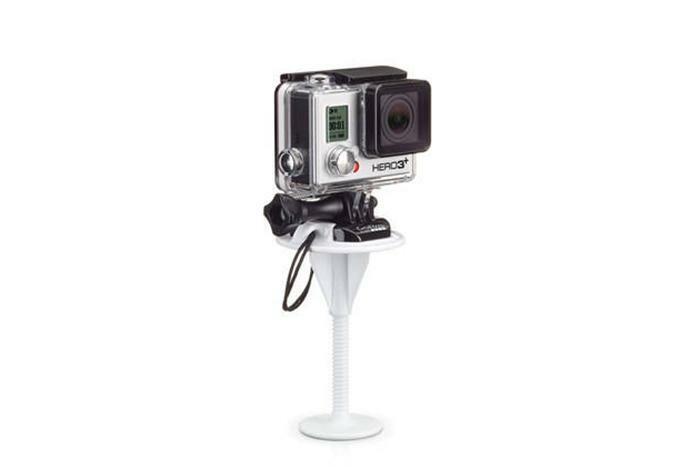 The 3-Way mount is now available for $70 and is compatible with all GoPro camera models. The 3-Way has three configurations that help you shoot POV or follow-cam footage. The Bodyboard mount was made with various types of boarders in mind. This mount attaches to any bodyboards, soft-top or foam surfboards or stand up paddleboards (SUPs) with a thickness of 1.5 inches to 3.5 inches (3.8 cm to 8.8 cm). With the Bodyboard mount, you can shoot fully immersive point-of-view footage, or you can get some really cool shots of yourself on the board catching those waves (you can always edit the video should you fall). Installation is quick and painless—a camera tether and locking plug are included with the Bodyboard mount, all you’ll need is a screwdriver. The mount also has a mounting arrow, which will help you choose the best possible angle when you install it. The Bodyboard mount is now available for $20 and is also compatible with all GoPro models. The Bodyboard mount attaches to your bodyboard, surfboard or SUP. Both camera mounts are moderately priced and offer many great features for people who love shooting action sports near the water or the slopes. Check out other GoPro accessories on the company’s main website. The Fujifilm X-T30 and Sony A6400 are two of the best cameras you can buy for under $1,000, but which should you choose? Each has an edge in certain situations which makes picking a winner difficult, but here's how they compare. Looking for a great camera without spending more than $1,000? From the stellar Fujifilm X-T30 to the beginner-friendly Canon EOS Rebel T7i, here are the best sub-$1,000 cameras on the market right now. Choosing the right camera strap for your needs can be a tough decision. To help sort through the junk, we've rounded up the best camera straps on the market for you to choose from. Photography news: Sony brings Eye Autofocus to critters via A.I. In this week's photography news, the Sony a7 III and a7R III have some new capabilities, thanks to updated firmware. Lexar teases a crazy fast 1,000MB/s memory card, while Vimeo launches bulk upload possibilities.